Five years after My Grape Escape, Laura and Franck are back in Burgundy to tackle their newest project, a derelict 16th-century winemaker’s cottage located behind Franck’s family home. 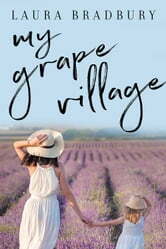 Navigating the different rules for raising children and managing a family in a small French village prove every bit as challenging for Laura as learning to drive a stick shift through narrow streets or arguing with tyrannical French officials over paint colors (spoiler alert: any color as long as it’s gray). Come along on this evocative and honest journey where love, coupled with good French food and local wine, pave the way to la belle vie.